With a new year so comes reflection and resolutions. 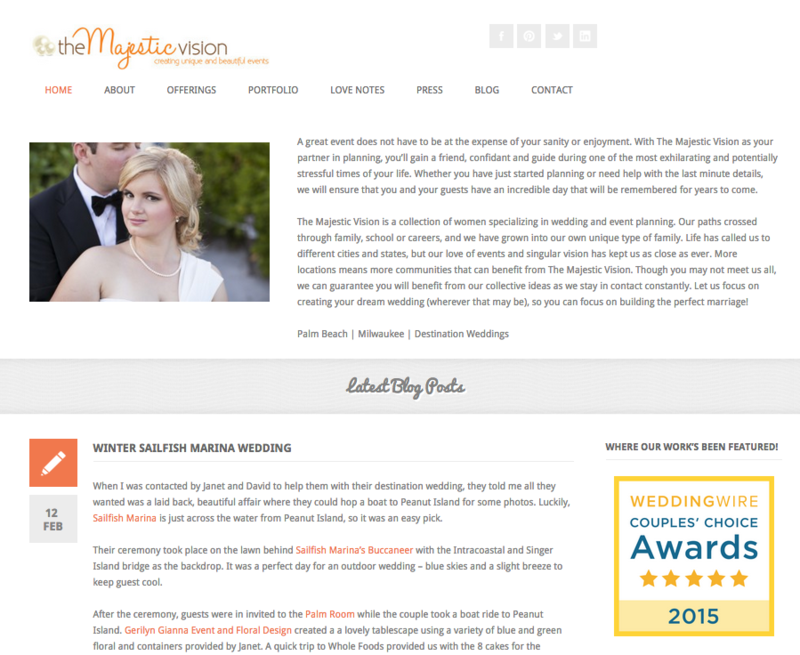 One of my resolutions for 2015 was to overhaul our Majestic Vision website. 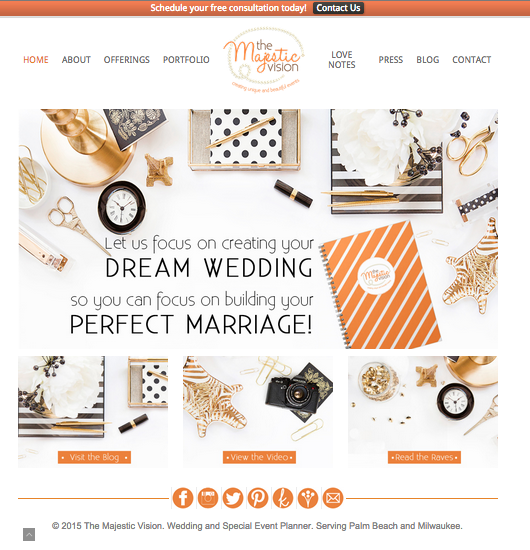 When we first launched this site, it was a great fit for the business. However, as we have grown and developed so have our needs. I have been contemplating a revamp for quite a while but was nervous at the idea of fixing something that worked perfectly fine. When I voiced my thoughts and anxieties to my husband, he was so supportive. Then he contacted his colleague Joe Wagner to help create the site I envisioned. A HUGE THANK YOU to Joe for all his hard work in making my vision a reality. Today marks the culmination of months of planning and execution! Let’s take a look at what has changed. First and foremost, the Home Page is completely different! Here’s a before picture. As you can see we completely changed the Navigation Bar of the site. We increased the size of the Home Page Slideshow and updated all the photos. We also removed the Blog and added photos with links to the Blog, Reviews and a Soon-to-be-Released Video about the business! Also the footer has been completely redesigned with our social media links. I LOVE it!!! The rest of the site pages also were updated. Unfortunately, I forgot to take before photos of those so you can see how much better they are. But I can tell you what changed. Before, the Offerings page had thumbnails for each of the packages, which you then had to click to get the information. I wanted it to be easier for potential clients to find the information, so I put it all onto one page. So much easier! The Portfolio page is completely new! If you remember, before we had a drop-down menu with all our events listed by name. This was great if you knew what event your were looking for, but it was not helpful to those that wanted a quick overview of the different styles I’ve worked with. This new format highlights one image from each event and the location of the event. When you click on the photo, you are taken to a page with all the images from the event. I think it’s a better way of showing the work. Our Love Notes page is probably the 2nd most changed page of the site. Before, we just listed the reviews from our previous clients. Kinda boring. But now, we have our reviews on this amazing page! The client’s name is listed in a bubble on the left and when you hover your mouse over the bubble, their review shows up on the right. How cool is that? I can’t take credit for this idea though. This was all my husband’s idea and I’m so grateful. The Press page also got a little bit of updating. Each year of publications is now identified. Plus, we are now listing everything from most recent to oldest. A small change, but I like it. Our Blog page stayed the same, since I liked it. But now it lives on it’s own tab instead of on the Home Page. Like I said, it’s a lot of changes. But I think it’s all for the better. What do you think?